Our firm is among the leading names in the industry for supplying Cotton Rags. The offered rags are made from high-grade cotton and are extensively demanded for packaging goods in electrical, food processing, pharmaceutical and plastic industries. These rags are made from high-grade cotton and are available at cost-effective prices as well. Highly used in shipping companies, industrial organisation and government organisation. 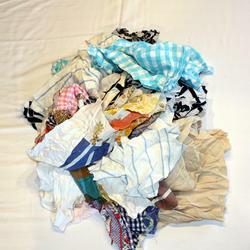 This wiping rag is made from shirts, tops and other cotton rich coloured clothing. This is a versatile and absorbent wiping cloth. Great for most spills in the work shop and general cleaning. Low linting.We have marked a distinct and dynamic position in the market by providing a high quality array of Duster Cloth.The provided waste is extensively used in textile industry for making mops, cloth wiper, mats and cloth dolls. This waste is highly acclaimed in the market owing to its varied remarkable attributes. Furthermore, our provided waste is strictly inspected against numerous quality parameters by our quality controllers to deliver a hassle free range at patron's end. 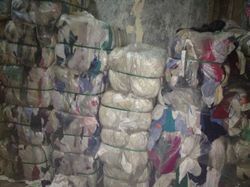 We are offering Cotton Waste to our clients. 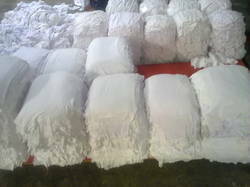 Cotton Waste offered by has bulk quantity of cotton which could be recycled quite easily using best quality machineries. 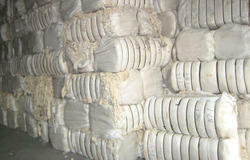 Owing to its versatility and effectiveness; Cotton Waste is widely demanded among our client base. Recycled cotton can also be used in industrial settings as polishing and wiper cloths and can even be made into new, high-quality paper. These cottons are used in stuffing and in many of the industrial applications. This materials are supplied in bulk quantity and delivered within the prescribed time frame. It is highly used in shipping company & govt organisation. Our firm is among the leading names in the industry for supplying different kind of Cotton Rags. The offered rags are made from high-grade hosiery material and are extensively demanded. These rags are made from high-grade cotton and are available at cost-effective prices as well. Our firm is among the leading names in the industry for manufacturing and exporting Cotton Rags. The offered rags are made from high-grade cotton and are extensively demanded for packaging goods in electrical, food processing, pharmaceutical and plastic industries. 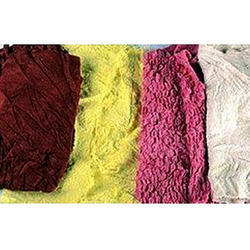 These rags are made from high-grade cotton and are available at cost-effective prices as well. We have emerged as a leading firm, engaged in and supplying a large variety of Colour Fleece Cotton Rags. These cotton rags are used in Heavy Machinery, Automotive, Oil, and many other industrial applications. Our range has the unique attributes such as high Lint Level, high Absorbency, and longevity and is able to be used in large cleanups. These multi-use rags are available at industry leading prices. Keeping in mind clients’ diverse requirements, we are engaged in manufacturing and supplying a large variety of White Printed Cotton Rags. These rags are one side plain white and other side printed. We have used quality approved raw materials and cotton yarns in fabrication of these rags. For various furnishing items, these rags are widely used by our clients. We offer our range in short duration of time and at most feasible rates. Towel Cotton Rags can be availed from us. These rags are used in heavy duty application in shipping, boat, engineering and many others. All these rags are sternly checked by our quality inspectors on the certain quality standards to ensure their quality and reliability.